Rep. Karen Boback (standing behind table) joined several legislators and Gov. 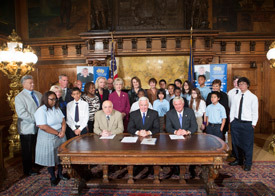 Tom Corbett for the signing of House Bill 108, which extends the Children’s Health Insurance Program (CHIP) through Dec. 31, 2015. Without action, the program was due to sunset at the end of 2013. HARRISBURG – Gov. Tom Corbett signed legislation Wednesday that extends the Children’s Health Insurance Program (CHIP), said Rep. Karen Boback (Columbia/Luzerne/Wyoming). That program meets the healthcare needs of uninsured and underinsured children across Pennsylvania. Without action, the program was due to sunset at the end of 2013. Currently, 188,098 children are enrolled in CHIP across the Commonwealth, with 880 from Columbia County, 4,516 from Luzerne County and 431 from Wyoming County. Federal funds pay for approximately two-thirds of the total cost of CHIP.